A step daughter is a wonderful blessing. Whilst they may not be a blood relative the connection and bond that can be formed is just as strong as with a member of your own family. So when you want to send them a card or let them know how special they are you will want to use something touching, inspirational and from the heart. That’s why we’ve put together these amazing step daughter poems and quotes. They cover all the needed occasions – weddings, birthday etc. 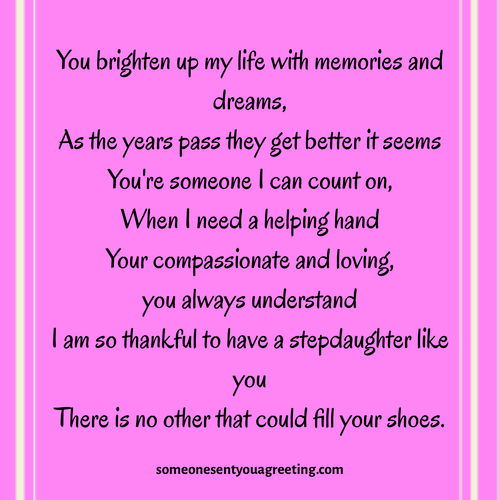 As well as inspirational poems to show you care and a big selection of step daughter quotes that can be used in cards for the same occasions. So use the below poems and quotes in cards, wedding toasts/speeches or just to say in person. And make your step daughter feel special and loved. 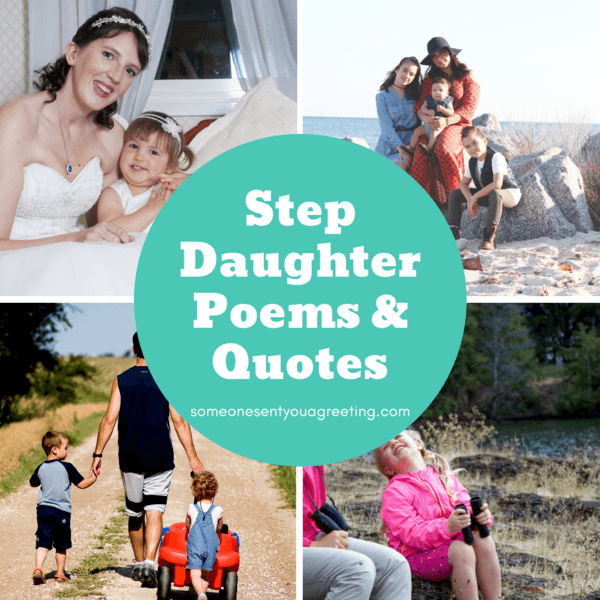 These poems about step daughters should be touching and inspiring snd a great way to let your step daughter know how important she is to you. I came into your life ten years ago and for the longest time you just didn’t want to know. I understood your feelings, but still it caused me pain. On the day I entered your life, I changed what I am. No more being selfish, time to be a better man. For you deserved more than the life had gave you. You were separated from your mother, by a cold and evil hand. All I could do was watch, and weep where I stand. All the while you hated me, and so you took a stand. I wanted to be there for you, to support you, and to hold your hand. They all told lies to you, about who and what I am. So for your hatred, I get it, I truly understand. In recent times you have grown into the finest young lady I know in all the land. Just who, what and why I am the way I am. I feel we have grown closer, but that may just be where I stand. I hope you grow to love me, and respect who I am. But if you don’t, I get it, I truly understand. I will always be where you need me, no matter where you stand. Because to me you are my daughter, I hope you understand. I had no part in making you, because I’m not your real dad. If I was your father maybe a better life would be had. Maybe not for you, but definitely for me. These people tried to separate us and prevent us from this bond. But no matter the circumstances, for you I will always try to be strong. It tears me apart when I hear you weep. I just hope that one day you’ll want to come to me. To nourish your soul and to dry your tears. Your strong heart and mind is what fueled you on. We are always family, and that is worth any price. I believe in you, I’m always here for you, just want you to know. I am so thankful to have a stepdaughter like you – There is no other that could fill your shoes. Wish a step daughter happy birthday with a loving poem that shows the positive world effect she has had on your life and how much you care on her big day. A wedding a such a special day, and if you’re going a speech or want to include something special in your wedding card for your step daughter then use one of these wedding poems for a step daughter. Hey, little girl! What do you think you’re doing? Without some words of wisdom from your old man? So, listen up, do you hear me, young lady? So smart and beautiful, I’m just so proud. I’m always good for a hug, a talk, and a chocolate chip cookie. As you go on your way, don’t ever stay away too long. Congratulations on your joyous wedding day and new life path. Seeing a girl grow into a woman. At awkward bodies and shy smiles. As love grew and blossomed before me. The promise of a life all girls dream of. The eyes of a bride. 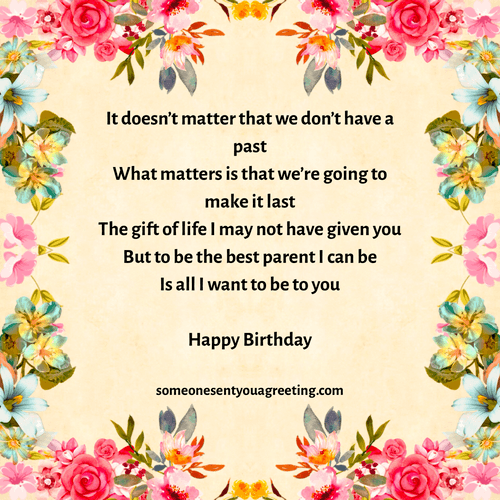 You can use these insightful and heartfelt quotes in a birthday card, as a wedding wish, share them on Facebook or just say to your step daughter. We aren’t “step”, we aren’t “half”, we’re just family.